A cute fairy-tale of a movie, elevated by the presence of Sanjeev Kumar and Shashi Kapoor. Durga Devi (Nadira) is a rich widow with a stepdaughter, Shanti (Vidya Sinha), and a daughter, Roopa (Moushumi Chatterjee). She treats Shanti like a servant and is so ill-tempered that she can’t keep an actual servant around for very long. So long-suffering, patient Shanti is perpetually left with all the work. In addition to his own insulting reception, Ratanlal witnesses the shabby treatment of Shanti, and returns home determined to do right by Amir Chand’s daughters. He asks his sons Ram (Sanjeev Kumar) and Laxman (Shashi Kapoor) to get married to the girls and to teach Durga Devi a lesson. Of course (being good sons) they agree immediately and vow to bring the girls home as their wives only with Durga Devi and Makhanlal’s consent. They formulate their plan: Ram will pose as a servant and get work in Durga Devi’s house to court Shanti, and Laxman will woo Roopa as a Maharajah’s son. 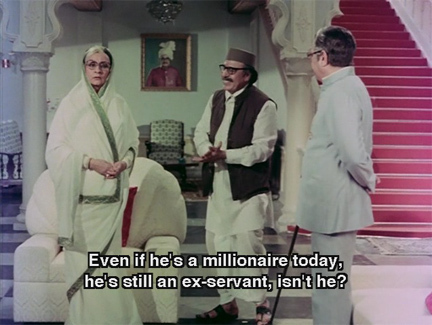 Laxman sets himself up as the Prince in a hotel run by his friend Jagdish (Asrani) and his wife Leela, who coincidentally went to school with Roopa. 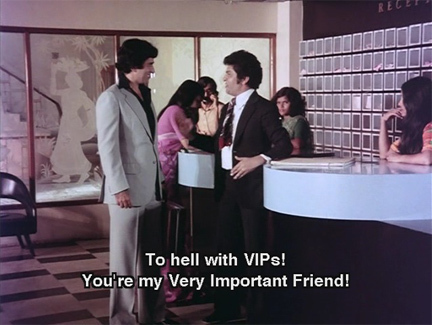 The brothers run into each other at Durga’s house and strangely, only communicate through whistles. Another good song (“Ek Mahal Ma Chham Chham”) and we are at the Intermission. The second half of the film is devoted to the wedding and the aftermath. Ram and Shanti leave after they are “insulted” by Laxman, who tells them that Shanti is the lesser of the two sisters. They go home to Ratanlal, where Shanti is astonished to discover that her new husband is rich and is warmly welcomed as the new bahu. Laxman has a way to go though, before he can tame Roopa and be sure that she loves him and not his money. He stages a drama whereby he is revealed to be poor, not the rich son of a king. He begins to come home every night to Durga and Roopa drunk and abusive, and he also steals some jewelry to buy more booze. Durga asks Makhanlal to intervene and help her get rid of Laxman, and invites him and his wife to move into the house with them. Laxman picks a fight with Makhanlal and Durga, and gives Roopa an ultimatum—him or them. This seemed to me somewhat unfair, since Roopa is now under the impression that he is a drunken good-for-nothing and her choosing to stay behind made more sense to me than her going with him would have (another culture gap, I guess!). But little does Roopa know that her husband, as bad as he appears, is far better than what lies in store. What will happen next? Will Roopa and Durga be rescued from the clutches of Makhanlal and family? Will Roopa ever see Laxman again? Watch Swayamvar to find out! 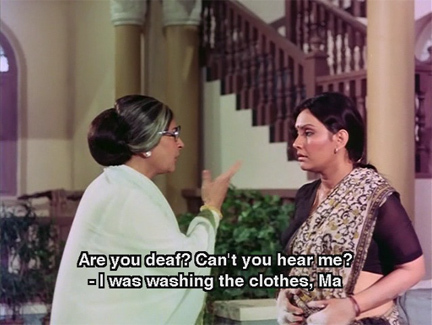 Nadira is wonderfully haughty as Durga Devi, and Vidya Sinha and Moushumi Chatterjee do full justice to their parts. Rajesh Roshan’s songs are tuneful and blend well into the story, too. The movie really sparkles, however, thanks to Sanjeev Kumar as the mischievous Ram and Shashi Kapoor as the proud Laxman. Posted on September 5, 2007 at 1:47 pm in Hindi movies	| RSS feed You can skip to the end and leave a reply. Gah! Just watched this – it was FAB! Mujhe Choo Rahi Hain was glorious, especially the reprise. 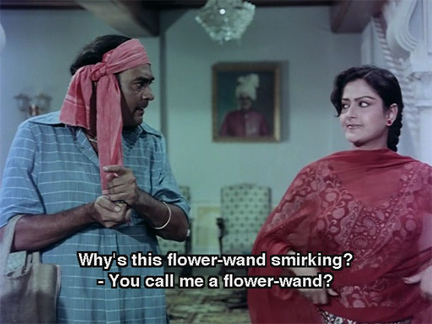 Dare I say, a sublime Shashi moment. Hey memsaab – great description. fabu detail. Taped it but I didn’t get the end!! Any chance you can email me and tell me what happens after Shashi gives Moushmi the sari towards the end? Its a hindi movie so I know it will all end well but would love to know how!! I watched this movie in a movie hall ( more than once) in 1980. The movie was produced by the publishers of Chandamama. Chandamama was/is a children’s monthly with stories from South but also available in English, Hindi and also Marathi (as Chandoba). I remeber, that the magazine always carried the ads for the movie and if remember right also the story in serial form. If I had the issues, they would have made a good present for you. Shouldn’t have sold it the raddhiwala. There was another movie somewhat on the same lines (why give up a success story?). Shriman Shrimati! Publishers of Chandamama, the children’s monthly also owned a Studio and production Company, Vijaya, which churned out super hit Telugu movies at a regular rate. Often they were dubbed or remade in Tamil too. Missamma in Telugu, Missiamma in Tamil, and Miss Mary in Hindi is an example. This movie “Swayamvar” was first made in Telugu as “Gundamma katha” (or Durga Devi’s Story to use names from this movie). Of course it was a super hit. This was way back in the mid-50’s. Thank you so much for such a wonderful review. It took me back to Mumbai in 1980. Sad that we no longer go to theatres to watch movies. The song – “Mujhe Choo Rahi” was a rage and yes, I think, Shashi Kapoor looked very very handsome. Memsab, what about that classic scene where Sanjeev asks Shanthi’s help to write a letter and Shanthi can’t control her laughter when Sanjeev cries out, “Baapu, O Baapu”. Very very hilarious. Sadly Vijaya movies shutdown as they couldn’t adapt to the changing times but whatever they did, they did extremely well. There was one more superhit song – “Nahin nahin koi tum sa haseen, iska hai matlab” was it in this movie ? These types of south indian produced Hindi movies(they sometimes look like stage plays, I never mind that)always remain favourites of mine.May be they are dramatic, but they are worth watching with good average music, good story , a little bit of masala,decent acting and suitable choice of actors.